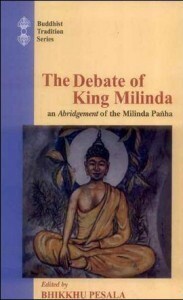 The Debate of King Milinda – The Milinda Pañha is a famous work of early Buddhist literature, probably compiled in the first century B.C. It presents the core Buddhist doctrines in an attractive and memorable form as a dialogue between a Bactrian Greek king, Milinda, who plays the ‘Devil’s Advocate’ and a Buddhist sage, Nagasena. A core Buddhist doctrine in an attractive and memorable form as a dialogue between a Bactrian Greek king, Milinda, who plays the ‘Devil’s Advocate’ and a Buddhist sage, Nagasena. bhikhu nagsen and king of milinda If have any material Pl healp me!